The original idea of a Johnny Ramone guitar list is from Ian Harper’s site Rockometer.com. However, that site has not been updated for a long time, so here’s an updated list of Johnny Ramone’s guitars. This site is still under construction – sorry if there are any mistakes. Fillmore Mosrite Ventures II Japan 1996 white probably none 1996 1996 backup (?) or storage Signed "Previously owned by Johnny Ramone July 10, 1996"
Some years before the Ramones John Cummings played bass in a band called Tangerine Puppets. Bought January 23, 1974 at Manny’s for 69.55 USD, the blue Mosrite Ventures II was the first guitar Johnny Ramone used with the Ramones. Around September 1976, the original tremolo has been replaced with a fixed Gibson style tailpiece. It did not have a Mosrite bridge but a Gibson/Schaller „harmonica“ bridge. 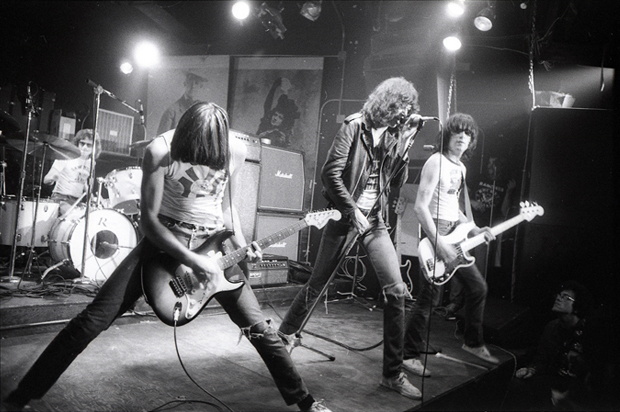 The guitar has been stolen on October 22nd, 1977 in the first theft of the Ramones‘ equipment after the show at The Aragon Ballroom, Chicago, and has not surfaced yet. 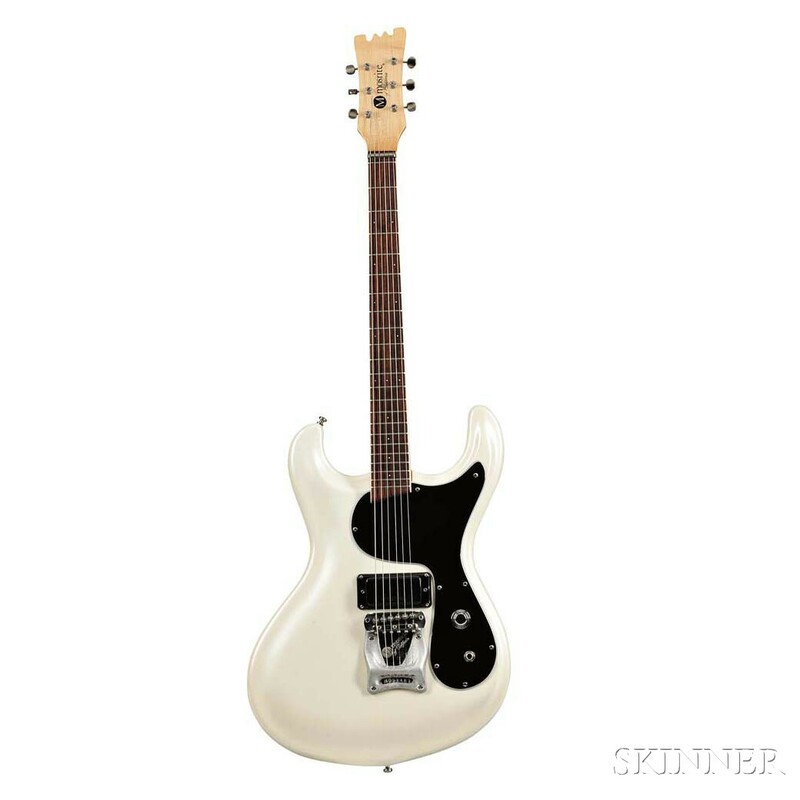 Immediately after Johnny lost his blue Mosrite it was replaced with the same model in white. I’ve never seen a picture or video that shows both, so wether Johnny kept the white as a spare or he was so lucky to find it directly after the blue was gone. The first video I know Johnny playing the white slab is of a three day show October 27–30 at CBGB’s, only five days after the equipment was stolen. From the very beginning as Johnny’s main guitar, the white Ventures II was modified: refinished, Gibson style fixed tailpiece without the Mosrite tremolo plate and grover Rotomatics that replaced the original Kluson Deluxe tuners. The spun Mosrite poti knobs have been replaced with black Gibson style bell knobs. Everything else seems to have been original. Between October 1979 and January 1980 the bridge pickup has been changed to a DiMarzio FS-1, the pickguard has been replaced, too. Around early 1983 the neck pickup has been replaced with a Seymour Duncan Mini Humbucker that has been tinkered in the larger original pickup’s cutout in the pickguard. Later the pickguard had been replaced again and the SD got a proper cutout (not really centered). Seems to have been used for the recording (or at least the photo story of the recording) of the first album in February 1976 only, guess it was only borrowed or studio equipment. Article here at facebook group Mosrite Guitars. This rare guitar has been used as a backup guitar around 1976 and then seems to have disappeared. The tremolo top has been replaced with an unidentified fixed tailpiece, the knobs with black Gibson style Witch hat knobs. Until around mid 1976 it has had its original pickups, later the bridge pickup has been replaced with a black P-90 style pickup. At The Club on May 12, 1976, it still had its original bridge pickup (see picture above). Early backup guitar from the era of the blue Mosrite, maybe stolen at the October 1977 theft. Rarely used backup guitar. It may have been stolen in October 1977, too, or it has not been owned by Johnny. Stock Gibson Marauder: original pickups, natural finish, natural headstock, white pickguard, rosewood fretboard with dot markers, chicken head blender at lower horn (from late 1976). Original condition with missing trussrod cover/logo. The bridge pickup is replaced with a Mini humbucker with mounting ring (attached with 3 screws). This guitar has been stolen in October 1977. If you compare the few existing pictures of Johnny’s maple glow Rick with those detailed photos that exist of Robin Zander’s 1959 Rick (Gibson Repair and Restauration’s pictures) you will see that these are two different guitars. There are differences that could be changed, like black nut (Johnny) vs. white nut (Robin), black knobs (Johnny) vs. silver inlayed knobs (Robin), bridge pickup Mini humbucker w/ screwed on mounting ring (Johnny) vs. toaster (Robin) (so there should be additional screw holes in the pickguard). – Johnny’s Rick’s neck through wood is way blonder than the rest of the body (you can see it from the front side), Robin’s isn’t. – Johnny’s Rick’s headstock’s had a triangle trussrod cover once (can be seen from the headstock’s yellowing and the single screw hole near the G tuner), Robin’s has a trapezoid plate (with according yellowing and screw holes). – The truss rod channel at Johnny’s headstock is longer than that of Robin’s Rick. If someone knows Johnny’s Rickenbacker’s serial number he can compare – Robin’s Rick is 4C482A. I only know one live photo of Johnny playing a sunburst Strat in late October 1977 at CBGB’s as a backup for the white Ventures II. This Strat may have been used as a backup guitar for a very short time after the other guitars have been stolen. 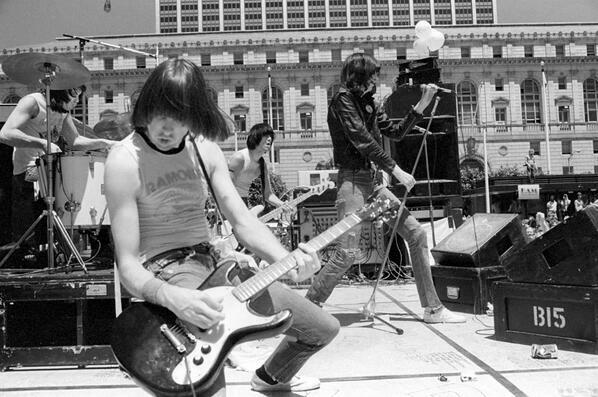 Again I know only one picture of this backup guitar, as a stage shot of this guitar and the white Ventures II appeared as a poster of the Tribeca Film Festival 2003 to promote the movie „Ramones – End of the Century“, photo by David Godlis. Again CBGB’s in late October 1977, I’d say the Mustang has been used as a backup only directly after the robbery – perhaps it only was borrowed for backup. Long time primary backing guitar that appeared some time after the October 1977 theft, around early 1978. This propably DiMarzio brigde-pickup-only equipped guitar with black neck and headstock (with unidentified white logo) seems to be not an original Mosrite but looks more like a custom made copy of a slab Ventures II. Ian Harper says it’s made by a fan or friend of the band. It has a Gibson style fixed hardtail and a Gibson style bridge. It disappeared around late 1982/early 1983, so maybe this guitar has been stolen in the second theft (April 24, 1983). serial number FA180 (January 1966). Traded (together with the Hamer X X0#¢) in February 1989 for a blue Mosrite Ventures II German Carve, B546. Has been auctioned in September 2015, sold for 56,250.– USD. Auction site: Item 8113 – Johnny Ramone’s Stage-used Rickenbacker Guitar Catalog 461 (Sep 2015). Serial number 0185. 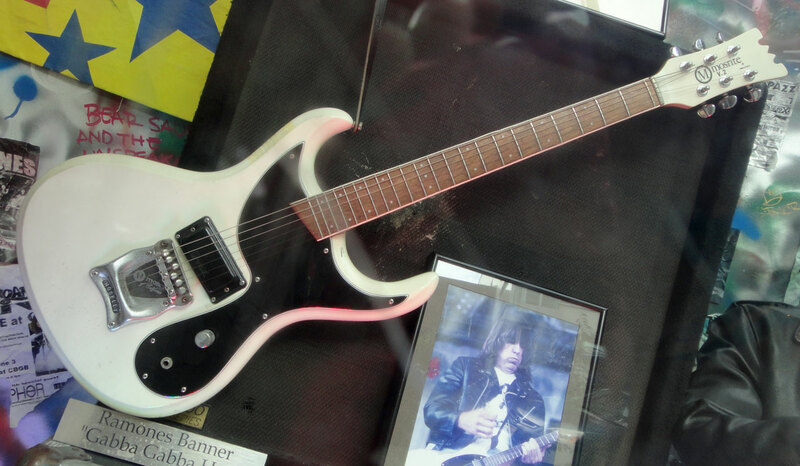 Custom made for Johnny Ramone by Hamer (according the the auction’s description) – deep body contours, no body binding. Unbound, contoured body in pre 1980 shape and a white headstock. Equipped with a DiMarzio FS-1 (?) in bridge position, original Kluson tuners were replaced with Schallers, played for example at 1980-01-31 - TOTP, London, England - Baby I Love You and at 1980-05-19 - Sha-Na-Na. Johnny traded this Hamer on May 22, 1982 to Adam Greiss for the sunburst Mosrite Ventures II (German Carve) that was used later in the „Time Has Come Today“ video. Adam Greiss played the Hamer (besides his white Mosrite Ventures Mark I) with his band Immortal Primitives that supported the Ramones live several times in 1983/84. Some info about that band here: Radio Mutation, September 29, 2006: Out of the Vaults, Into Your Ears #14. And he played both guitars at the band’s revival in 2015: The Adam Greiss Group (HD) — Live at The Sparks Reunion 5/9/15 The Crooked Rail, E. Northport, NY. Auctioned May 19th 2016, sold to Linda Ramone for $55,247.50. Auction site: Item 7498 – Johnny Ramone’s Owned and Stage-Used Signed Hamer Guitar Catalog 476 (May 2016). Description and photos here at icollector.com. I don’t know if there’re really two additional Hamers that Johnny has owned, but if you compare this picture (that’s supposed to be X X0#¢) with 0815 and X X0#¢ you can see a different headstock logo and the earlier positioning of the 12th fret’s dot markers – at least this is another Hamer Johnny’s used. 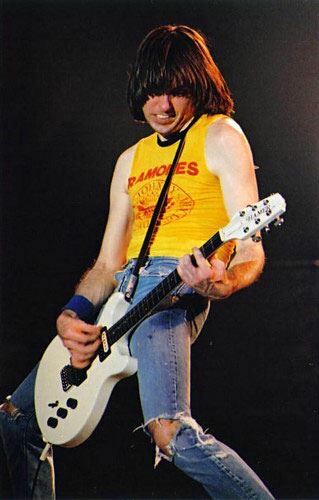 Serial number X X0#¢, custom made for Johnny Ramone by Hamer, completed May 12, 1980, based on the Special, white headstock, „beveled edges thin neck thin body“ (Hamer). Traded (together with the Rickenbacker 450 FA180) in February 1989 for a blue Mosrite Ventures II German Carve, B546. Has been auctioned in July 2015, sold for 49,889.35 USD. 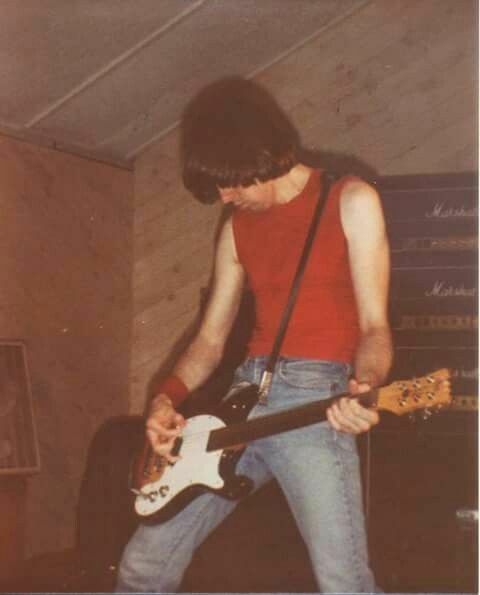 Auction site: Item 7411 – Johnny Ramone’s Early 1980s Stage-used Hamer Guitar Catalog 457 (Jul 2015). Again, the picture on the right (the Hamer ad) shows another Hamer than X X0#¢ according to the different (larger) headstock logo. On Dutch TV show TopPop Johnny is playing a Sunburst Strat at a lip sync performance in 1980. TV prop only, I guess. Backup guitar Johnny got on May 22, 1982 (from Immortal Primitives‘ Adam Greiss in trade for the white Hamer s/n 0185), also used in the music video for „Time has Come Today“. This guitar has been stolen in the second theft, April 24, 1983, I guess. 1965 or 66 model with custom made full size pickguard and only one DiMarzio FS-1 (probably) at the bridge, Gibson style tailpiece instead of the original Moseley tailpiece, Grover Rotomatic tuners. This guitar appeared in May 1983 to replace the stolen backup guitars. Johnny gave it away to the Ramones‘ security chief in May 22, 1990. Has been auctioned the third time in January 2015, sold for 71,875.- USD. Auction site: Item 2173 – Johnny Ramone’s Longtime-owned and Stage-used Guitar Catalog 445 (Jan 2015). Finally Johnny found an adequate backup guitar in 1984, a brown slab Ventures II. Later, for the Ramones‘ „Acid Eaters“ Tour, this guitar had been refinished gold. In opposite to Johnny’s three other slab Ventures II Mosrites this is the only generation 2 slab, s/n B120. 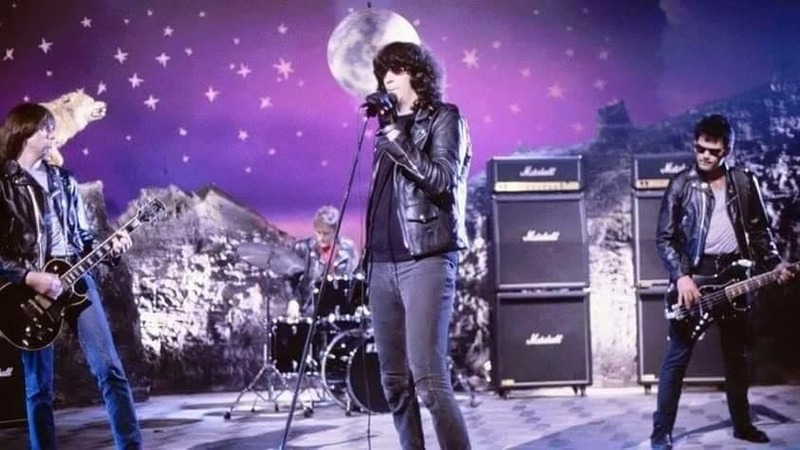 Johnny Ramone can be seen playing a black Gibson Les Paul Custom on German TV at „Formel Eins“ on June 27, 1985 in Grünwald/Munich, doing a playback performance of „Howling At The Moon“. Only four days later, Johnny is playing a red Strat at a lip sync performance, again for German TV. Aired live in „Musik-Convoy“, WDR, July 1, 1985 from Freibad Münster-Hiltrup, Germany. Traded in February 1989 for the custom made Hamer Special and the Fireglow Rickenbacker 450. Used for rehearsal and storage only, near mint and stock, serial number B546. In 1989 Semie Moseley had built a custom guitar for Johnny Ramone, serial number 001. Black custom made one pickup Mosrite – Johnny gave it away to another NYC based guitar player. It seems Johnny got another Mosrite Ramones model from Semie Moseley that he kept quite long. White 1990 Ramones model with one pickup, serial number R9003. As of October 2016, that guitar is auctioned here: www.skinnerinc.com – sold for $28,499. 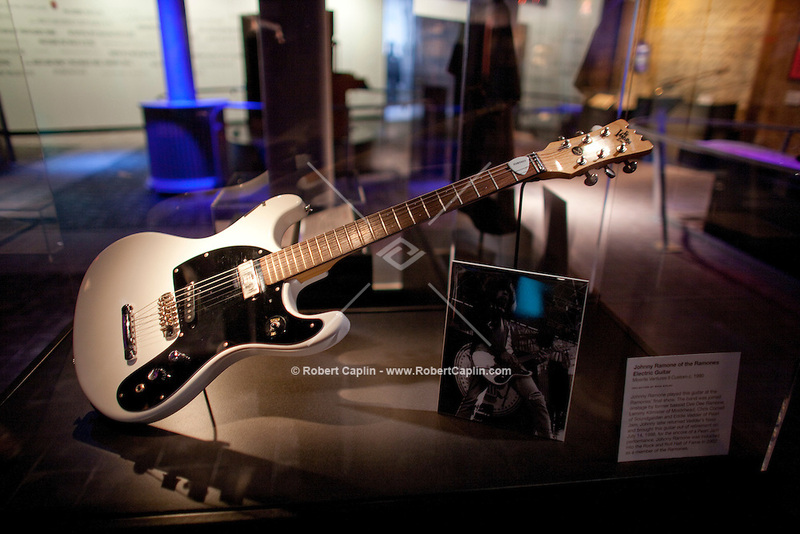 Ventures model on the headstock, this guitar had been given to Johnny Ramone at the Ramones‘ 1995 Japan tour. It was sold May 1, 1996, signed at the headstock’s back. signed and inscribed on the reverse of the neck „This is the last guitar played on stage which was in 1998…..Los Angeles, also used on Lollapalooza 1996, Johnny Ramone, 5/11/01“. This guitar was initially sold at auction in the late 1990s. 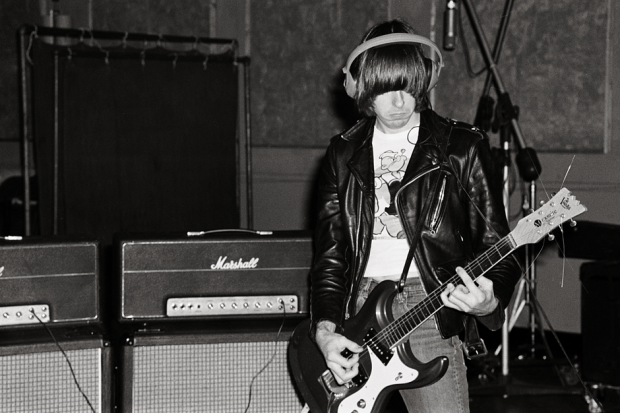 June 12, 2012 it was auctioned at Christie’s/London for GBP 22,500/USD 34,785: Lot 111 Johnny Ramone. Maybe a third endorsement guitar from Japan, as it’s signed by Johnny „Previously owned by Johnny Ramone July 10, 1996“.